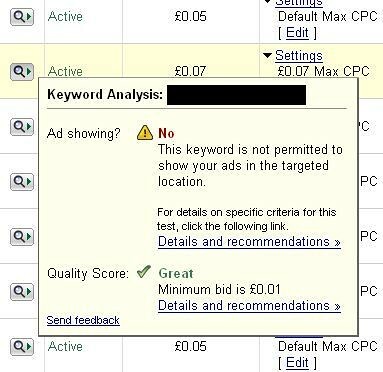 There are wide spread reports that Google AdWords Ad Diagnostic Tool is on the fritz. Many advertisers are noticing that the tool is reporting that their ads are not showing for one reason or another but yet the ad is actually displaying in the Google results. Notice, it says your ad is not showing, because "this keyword is not permitted to show your ads in the targeted location." But yet, the ad is showing on Google.com and on the Ad Preview Tool. Engineering is aware of this, and is taking a close look. In the meantime, one may use the Ad Preview tool to confirm the appearance of one's ads.